With a stylish and elegant look, the Butterfly Spirit 18 Rollaway is the top of the range outdoor model. It incorporates an 18mm plywood resin weatherproof top which has a playing performance similar to tournament tables. 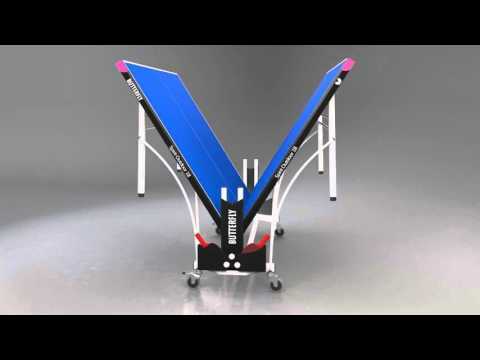 It is combined with the quickest and easiest system for setting up a table. A full length weatherproof cover, Butterfly outdoor net and post set, 2 bats and 3 balls are included, making it ideal for hotels, conference centres and as the better quality outdoor table for home use. Top of the range strong Centrefold style rollaway table for use in schools, homes, garden, hotels and holiday centres. 18mm plywood resin playing surface, which provides a consistent and extremely good bounce and playability for an outdoor model. The top has the strength of steel and the feel of wood and provides a long playing life. The top incorporates a coating of polyurethane paint which protects it from adverse weather conditions. Protective, strong steel frame with stable magenta corner pieces. Both halves fold into a central undercarriage for easy set-up and movement. Conforms to the new Central European Norm (CEN) safety regulations: EN 14468-1. Includes a Butterfly Outdoor net and post set. Includes bat and ball holder with 2 outdoor polypropylene bats with reversed rubber and 3 quality practice balls. Includes full size heavy duty weatherproof protective cover. 5 years guarantee (table only). • Minimal assembly required (approx 15 mins) before first use.